Mo'Rockin is a six piece group which blends rhythms from around the globe—including Middle Eastern, African, Spanish and American—and performing it all on traditional and modern instuments. You can find Mo 'Rockin in the Moroccan pavilion at Epcot during your next visit to Disney World. Amir Ali founded Mo 'Rockin in (1998), and has been performing at Epcot's Moroccan pavilion for eighteen years. Amir Ali was born and raised in Meknes, Morocco where his studies included eight years of music theory, classical violin, Arabic music theory and oud. At age seventeen, Ali came to the United States where he studied jazz, funk, American pop, blues, R & B and hip hop. He has recorded with numerous major record labels and toured with such famous musicians as Abboud Abdel Al, Haj Younes, Amad Doughane, and many more. Mo 'Rockin plays its own original music during its 20 minute sets that it plays at Disney World. The varied sounds and influences really make this a true World Music feel. Besides their style of music the instruments that they play are not what you would typically see in a "rock band". Although you may see an occasional violin, how often would you see an Oud or a Zendrum? 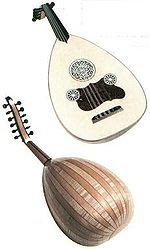 The Oud is an instrument that has its roots going back 4500 years and is very popular in Arabic countries even today. The The Zendrum is a MIDI (Musical Instrument DigitalInterface) triggering controller designed by drummers to allow musicians to express their creativity in rhythmic and intuitive ways. However, the Zendrum can trigger ANY sound via MIDI, so it is much more than drums yet as easy to play as tapping your desk with your fingers. Unlike a keyboard, there are no moving parts to break or wear out. 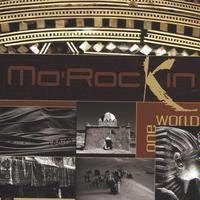 If you love Mo 'Rockin you may want to check out their CD entitled "One World". They are a Disney World and an Epcot World Showcase staple entertaining and exposing people to musical influences that they may not be familiar with, but find themselves liking. Who doesn't like a band that has their own belly dancer? 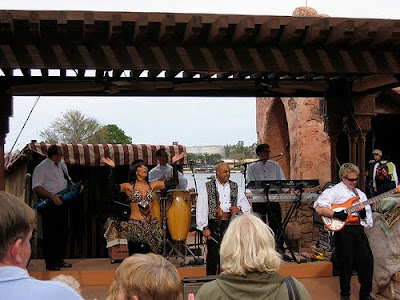 If you are not familiar with Mo 'Rockin certainly check them out during your next visit to Epcot. Their performances are free with your Epcot admission. You will be entertained and you may find yourself enjoying a type of music you have never heard before. 0 comments to "Mo 'Rockin Rocks Epcot"